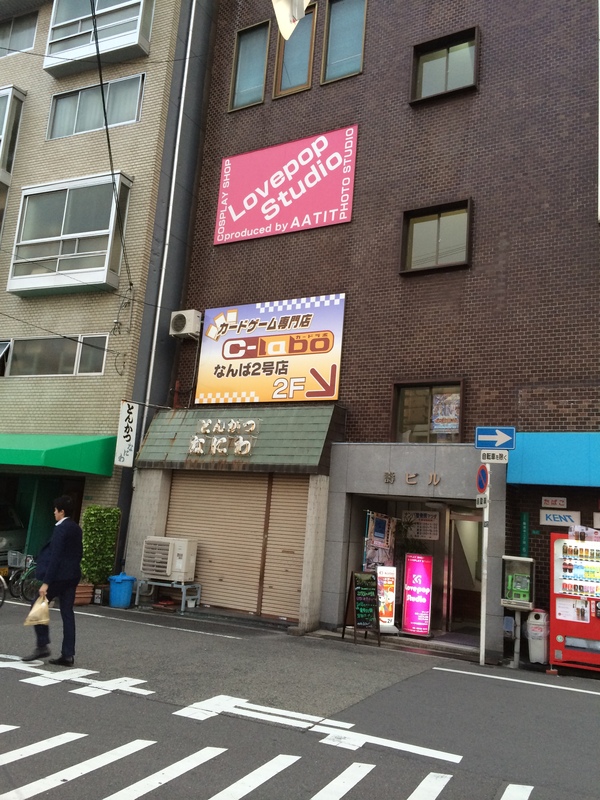 Visiting Nipponbashi | TCG, shiyo? Many who visit Japan are aware of Akihabara (Akiba for short) in Toyko, often talked of as a Mecca for nerds, geeks and otaku. Far fewer are aware of the Osakan equivalent, Nipponbashi, also know as Den Den Town. Whilst not as sprawling as Akiba, this means there is still a good selection of shops within easier walking distance of each other. Since most of those who would read this are TCG players (mostly Weiβ Schwarz), I’m going to be concentrating on what they can check out in Nipponbashi. There’s much more besides this, but you’ll have to check them out on your own. If you can work out your way around the Osaka underground, the easiest thing to do is get to the Nipponbashi station and walk from there. There are several other stations near to the central area of Nipponbashi, such as Ebischuo and Nanba, so it will depend on which is easiest for you to get to. When you get out of the ticket gates at Nipponbashi there should be some stairs going up to street level on your right. There are pictures of food from local restaurants on the wall next to the stairs, so they’re a bit hard to miss. Once at street level you’ll see a road directly in front of you. Turn slightly to your left and follow that down. When you have a chance, crossto the other side of the road. Keep going forwards until you reach a crossroads, with some small patches of grass on one of the corners. As you might have guessed from the sight of the maid cafe on the opposite side of the crossing, you’re pretty much there now. I would normally cross over the road and then turn right, continuing straight until you reach another left turn. This is the start of the main shopping street in Nipponbashi, and where you’ll be spending a lot of your time. 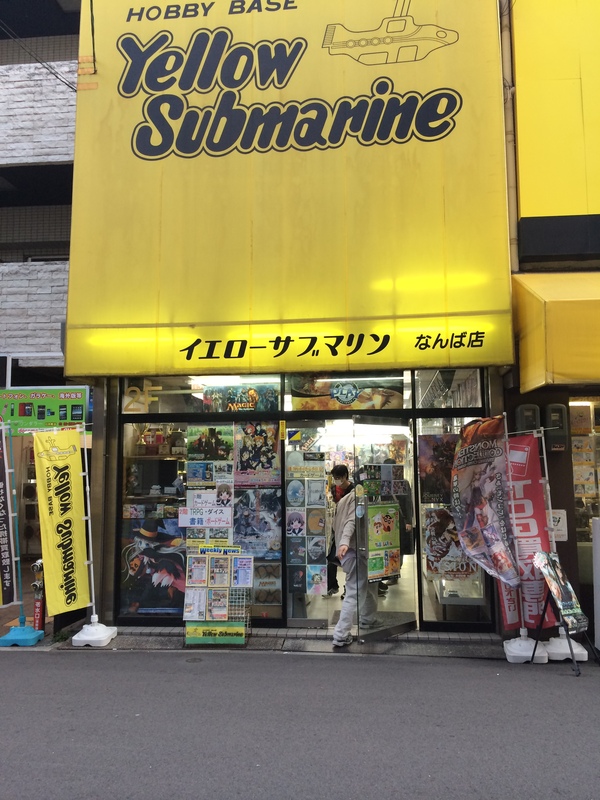 One well known chain of card (and more) shops in Japan is Yellow Submarine, which has several shops in close proximity to each other. If you’ve entered from the direction I talk about above, the first one you will come across is the Namba 3 Yellow Submarine. 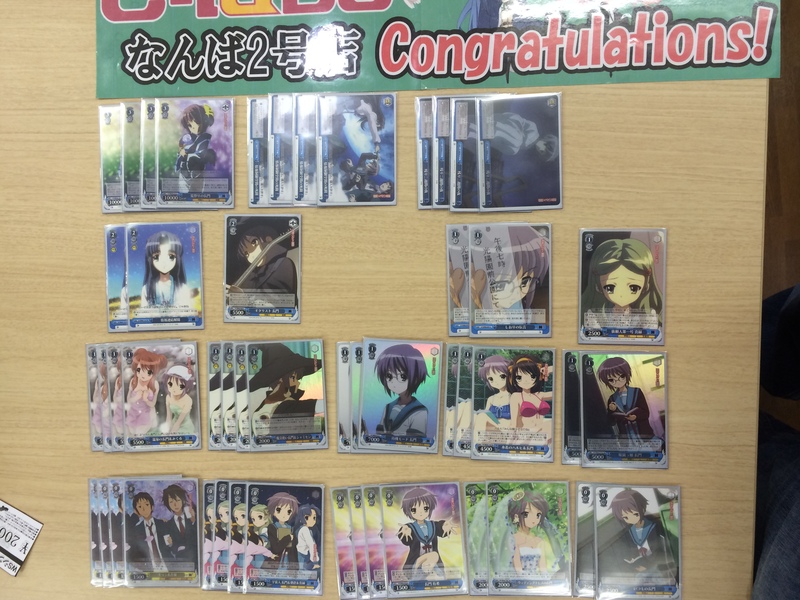 On the ground floor they have a display of Weiβ Schwarz cards for usually the most recent couple of sets. A few older cards can also be found on the 2nd floor. The ground floor also has a good selection of sleeves and general card goods. Several other TCGs are split between the first 2 floors. If you go up to the 3rd floor (and 4th if its open), you can find some play space. This could be just for free play, but sometimes they’ll have tournaments, since they’re one of the places that holds official shop tournaments for Weiβ Schwarz. If you turn right after the Yellow Sub there is an Amenity Dream ( アメニティードリーム) hidden down the side street, which can be pretty easy to miss. I went about 6 months before finding out it was there. Just look for the floor which has アメニティードリーム listed. They seem to have a good selection of WS cards, but I don’t think I ever bought from them. They also have a fairly large playing space, but this seems to mostly be taken up by Magic players. If you go straight on from the Yellow Sub there is another hidden card shop on your right, just after the Warhammer 40k display. If you take the lift up to the 2nd floor you’ll be able to spot it from all the Yu-Gi-Oh! posters. They’re mostly a Yu-Gi-Oh! shop, but do sometimes hold Weiβ Schwarz events. Although in my experience, outside of the WGP preparation event, they get less than 5 players. Continue further on and you’ll reach a crossroads with several different card shops nearby. Directly on your right will be the Card Pal. This shop mostly deals in Yu-Gi-Oh! and Weiβ Schwarz, with play space upstairs that sometimes holds tournaments for both. They have a good selection of Weiβ Schwarz cards, and it’s generally worth looking in their PR display if you’re after some hard to find cards. They’re also one of a couple of shops in Nipponbashi that you can request cards from their massive selection of cards behind the counter. They have many folders on display which you can look through to see if they have any cards in stock. If you want a card, you need to write down the game, it’s name, the code, the price and so on, then they’ll look for the card for you. Be warned though, it’s a very cramped space for writing down card names, and you’d better hope you’re not after cards like this. If you return to the crossroads, you’ll notice there are two more Yellow Submarine’s just on your left. 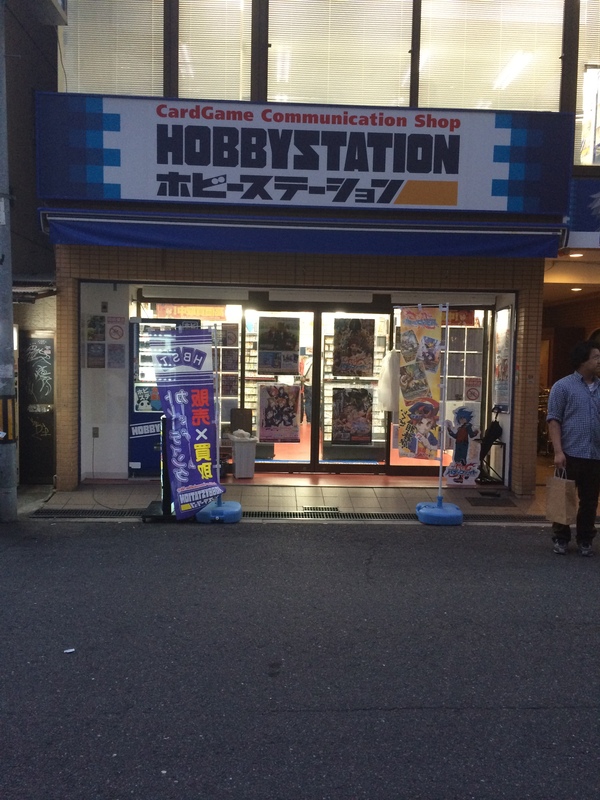 The first is a figure shop, whilst the 2nd (Nanba 1) is another TCG shop. The Weiβ Schwarz cards on display here are a little older than the ones in the first Yellow Sub, but they also have plenty of folders to look through for any cards you might be after. They also have play space on the 2nd floor, and sometimes hold tournaments. Upstairs also has a good selection of board games if you’re into that. Returning to the crossroads, if you continue straight on from where you started (So car park on your right), you’ll come to Gamers. There’s a little card shop hidden on the left just before you get, next to the retro game shop with the Mario outside. They have a tiny bit of play space, but it’s usually fairly empty. There’s a little bit of Weiβ Schwarz, but a lot of space is taken up with things like Yokai Watch medals, and one of the DBZ TCGs. 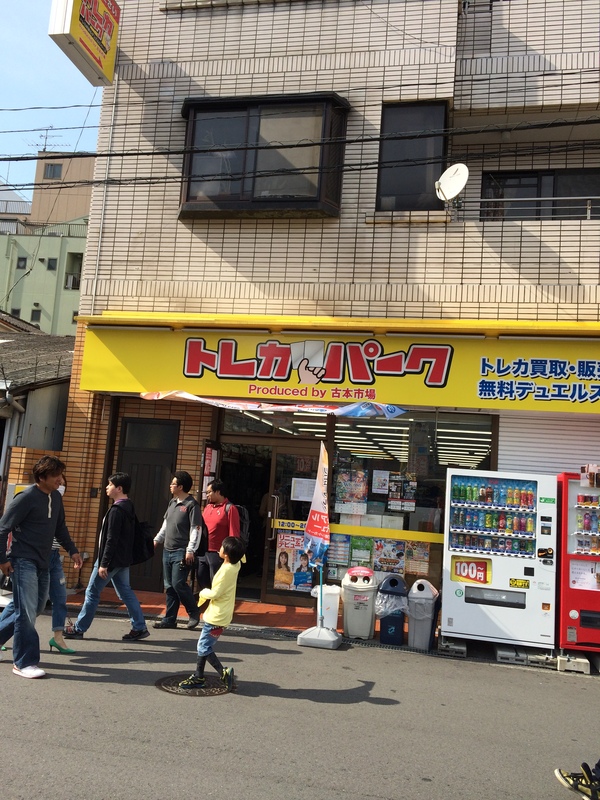 Gamers is one of the big general purpose Otaku shops in Nipponbashi, but if you’re after cards you need to head down the left side of the shop, where all the Gashapon are. 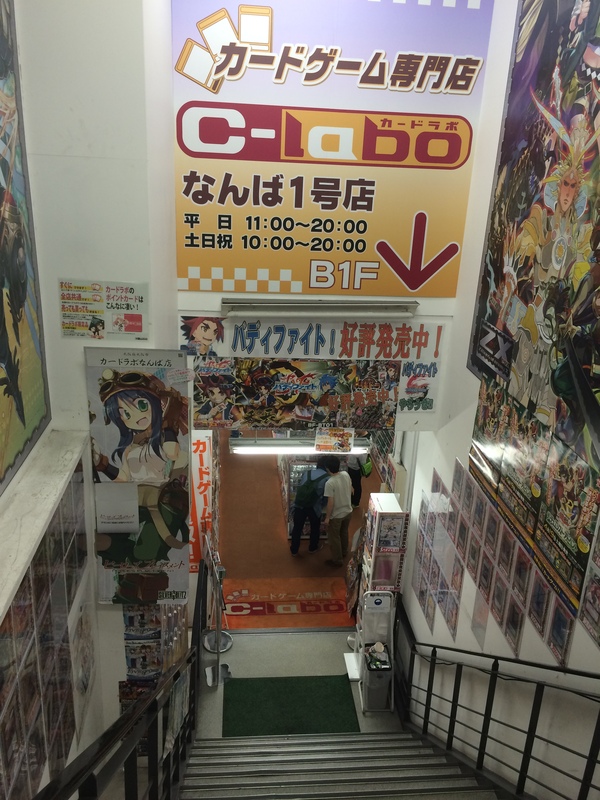 Here you’ll find stairs down into the first of 3 C-Labo. This shop has a good selection of cards on display, mostly Weiβ Schwarz, Yu-Gi-Oh! 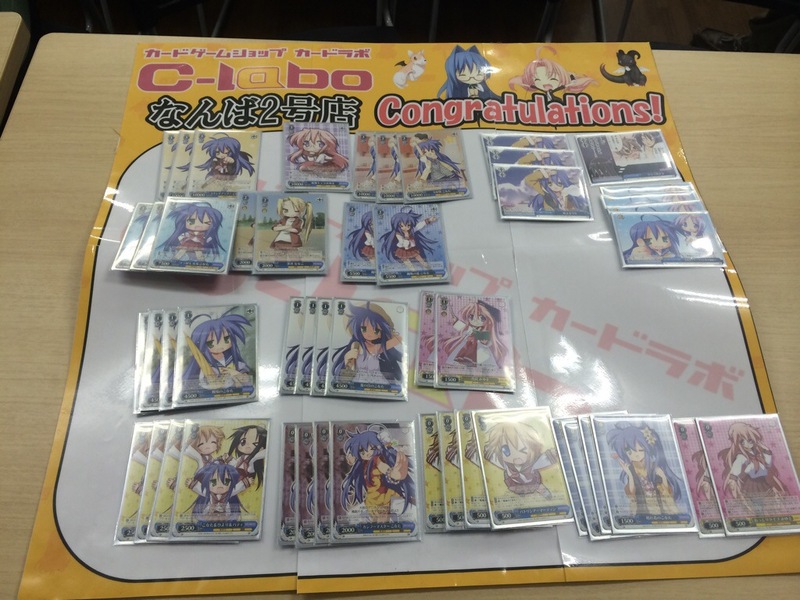 and Cardfight! Vanguard. There’s also a sleeves display that can sometimes have rare or valuable ones on display. If you’re after something from here, make sure you check out the other two C-Labo as well, since prices can vary. 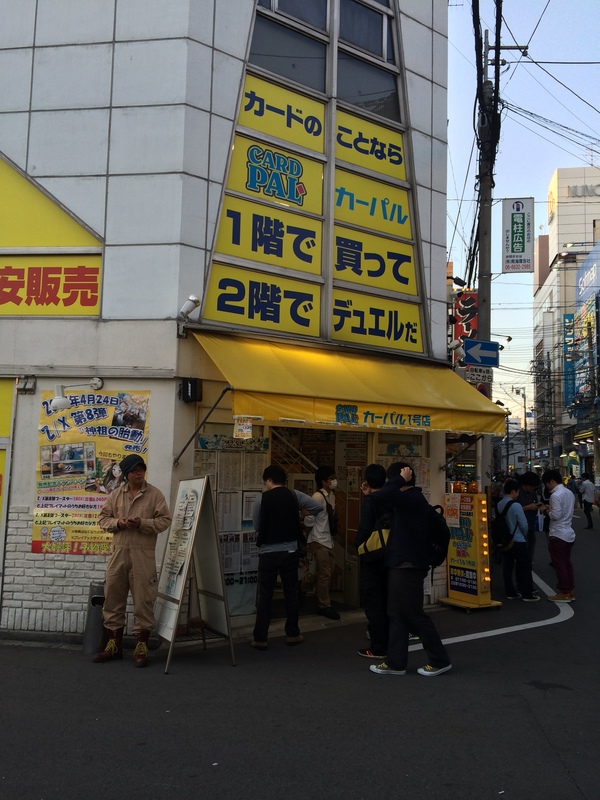 There is also probably the largest free play area in Nipponbashi down here, so its a good place to go for free games. Sometimes they do hold tournaments, or have other special events that completely close off the free play area, so you won’t always be able to use it. If you return to the main road and continue forward you’ll soon come to a T junction, with some more card shops in the vicinity. On the left you’ll find a Hobby Station, which is another of the big card game chains. They have a good selection of Weiβ Schwarz, Yu-Gi-Oh and a few other games, plus a big display of card sleeves. Sometimes it can be worth asking if they have certain cards behind the counter, because they aren’t always on display. I managed to get some really cheap Patricias from Lucky Star because of this. Upstairs are even more card games, and a playing space. They often hold official tournaments here, and it’s one of the most popular, so make sure you get there and register early if you want to play. Going back to the main road, you’ll find a shop called Dragon Star just past the T junction. They have two neighbouring shops, with a good selection of cards from many different card games. You can often find rare Weiβ Schwarz cards here, and pretty cheap ones too. Make sure to check out their ‘damaged’ section for good deals if you don’t mind some barely noticeable damage. They also have a huge collection of rare Yu-Gi-Oh merchandise, such as Worlds Prize cards and trophies. Be warned, the shop can be very hard to move around in, and it’s not a good place if you’re claustrophobic. Thankfully recently they expanded the space around the Weiβ Schwarz area, so it’s not quite so painful to look any more. Just after this, a new TCG shop opened recently, but I can’t recall its name. 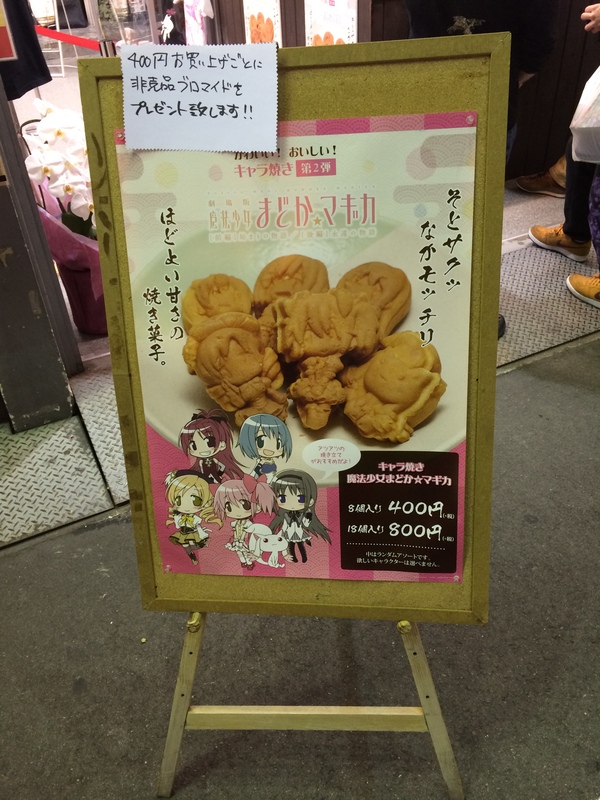 It’s on the 2nd floor, near a maid cafe, so make sure you go into the right shop. There’s a free play space and a good selection of cards, but I wasn’t there long enough to give a proper junction. 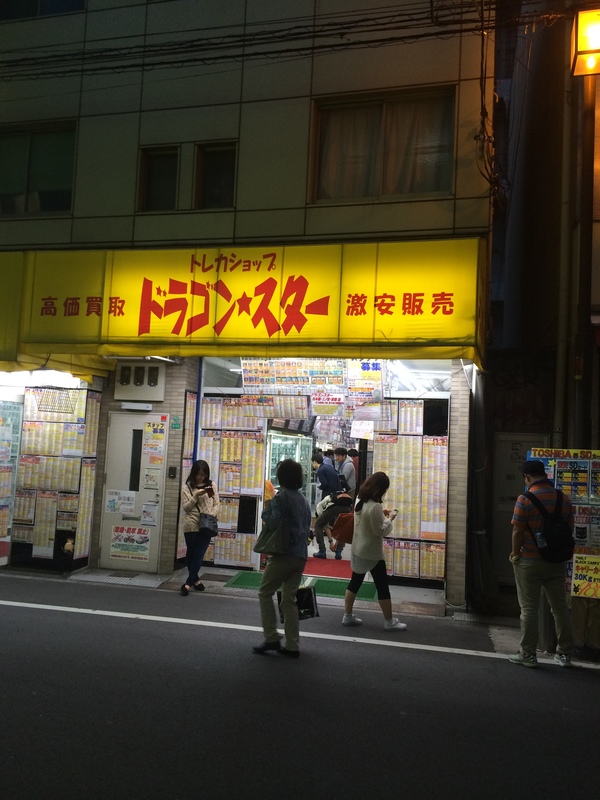 Also along this street is a shop that often sells character-yaki, if you’re after something novel. In the past they’ve had Madoka and Vocaloid. If you keep going straight, you’ll reach a big building with an Animate and several other shops. You can’t miss it from the signs down the side. 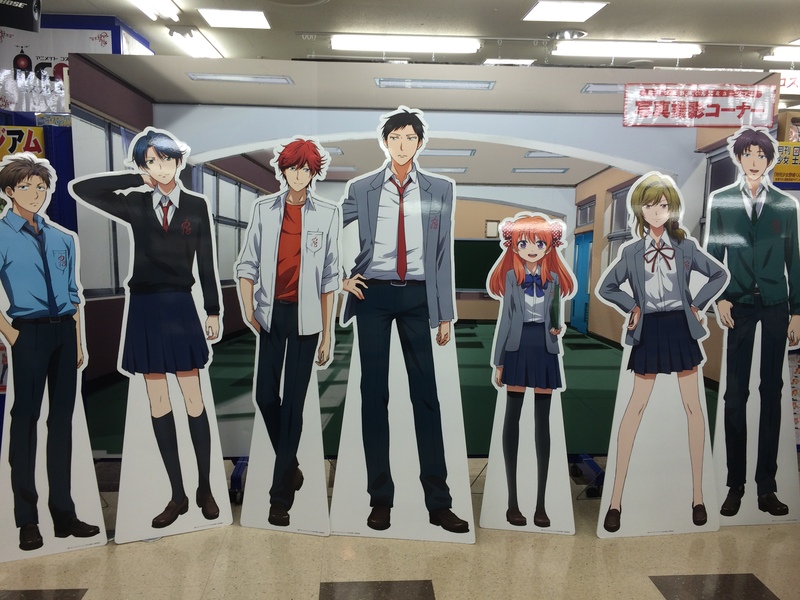 Animate is good for anime / manga, and they’ll sometimes have special exhibits for series like Nozaki-kun. 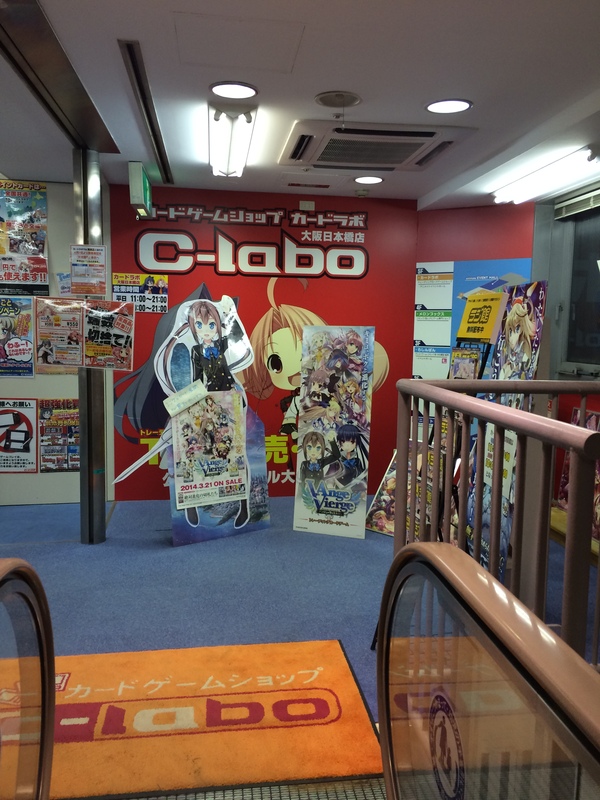 If you go up to the top floor you can find another C-Labo. It’s worth looking here because the selection and price can be different from the others. There’s also a free play area, but you need to pay a small fee or buy from the shop if you want to play in there. The Animate building is pretty much the end of the main street in terms of major shops, but that doesn’t mean we’re done yet with the card shops. If you return all the way back to the Card Pal, and this time go left rather than straight, you’ll find a couple more shops. Up first is Torekapaku (Trading Card Pack? ), which has a good selection of cards, sleeves and general TCG products. Keep an eye out for weird things like the bread or pizza playmats. They have a free play area, where you can sometimes find people to play against. Sometimes they’ll have full sets of Comeback PRs for cheap, so make sure to keep an eye out for them. Continue to the end of the road and you’ll find yet another C-Labo. The product selection is about the same as the others, but with the slight variations you would expect. They have a free play space that can seat about 40-50 people, and is generally good for free play. If you’ve been keeping up on my blog, this was the shop where I’d take part in tournaments every Sunday from 5pm. They were unofficial ones with a ¥100 yen entry fee, but were usually well attended. At the end of the event, you’ll get some random cards as a prize, with higher placement getting to earlier and more picks. Due to this, even if you come last, you might get a good card out of it. Usually numbers would be in the high 20s, early 30s, dropping below 20 on a slow week, or above 40 once. It’s a nice play environment, and there are a lot of good players who attend. People will usually change up decks from week to week, and won’t always go super competitive. Some weeks you might be facing Kancolle and Nisekoi, the next mono-Sara Da Capo or Noise. Once people lose a single game, they tend to switch decks, so its still fun even if you don’t top. If you manage to win one of the blocks they’ll even put a picture of your deck up on their Twitter account (@nanba2_labo), and they’ve recently started streaming some of the games on Niconico. If you leave the C-Labo and look left, you’ll spot a Big Magic. 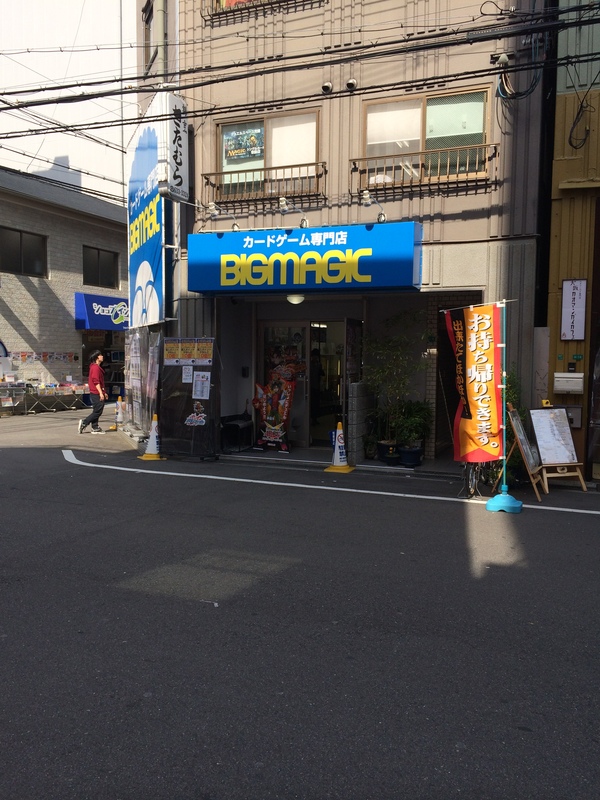 This is mostly a Magic shop, but does also stock Weiβ Schwarz and other card games. There’s free play space on the 2nd floor, but it’s usually pretty busy with Magic players. It can be a pain to see some of the Weiβ Schwarz cards, since they’re directly under some of the Yu-Gi-Oh folders, which are usually being looked at. If you continue past the Big Magic and go to your left, you can find a few more card shops, such as Card Kingdom, but this can be a bit expensive. Due to this, they do have quite a wide range of cards in stock. In addition they have free play space, and often hold official shop tournaments. If you headed to the right instead, you’ll eventually get back to the crossroads where you started all of this. There are probably even more card shops dotted around, but these are the most prominent. If you can venture out a bit further, make sure to try and find Hurricane Shinsaibashi (you will probably need to look that up in Japanese, or find it on the official site). This shop is the official gold / silver bag trade in station for Osaka, so you might be able to get some rare items if you have any lying around. If you’re after figures make sure to check out the shops down the left hand side of Nipponbashi, next to the main road. Just go straight from the station instead of turning. Make sure to check out the big arcades too if you get a chance. As you wander around, you’ll have no doubt noticed plenty of maids (or shrine maidens, school girls etc) handing out fliers, so if you’re into that there’ll be plenty to keep you occupied. If you have any further questions about visiting the area, don’t hesitate to drop me a message on here, or you can find me on Twitter @Xagor1. Next Post → Catch up and where to go from here? 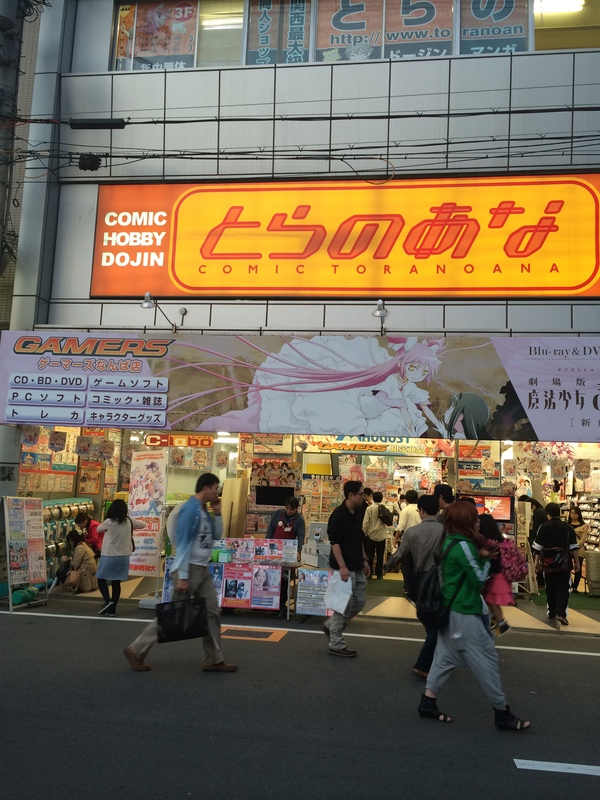 > Just after this, a new TCG shop opened recently, but I can’t recall its name. It I think probably the thing of Card Box Nipponbashi . Thanks! That sounds about right for the new shop. Was a lot of fun playing on the Sundays. Hopefully will get another chance to visit.